Control moles & pocket gophers in below-ground applications in lawns and flower beds. 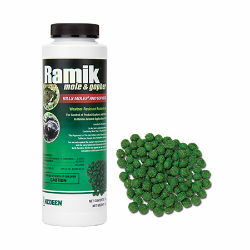 Ramik Green rodenticides are formulated without wax for high palatability and weatherability. 1st Generation Anticoagulant. Death may occur within 4-5 days after a lethal dose is consumed. Food quality grain mix.